The Knitting Pirate » In Which the Pirate Gets Her Sock On. « In Which the Pirate Finishes a Scarf. In Which the Pirate Gets Her Sock On. So! It's not that the sock is too small, it's that needles - even bamboo needles - are really inflexible, and don't care to bend over my instep. I knitted a little further out of frustration, then sorted the stitches out onto five needles, instead of three, and tried again. And here it is! The Pomatomus sock, finally on my foot! I could not be more pleased that I don't have to rip back and begin again. Times like this, I wish I didn't have such long feet. I wear a 10.5 (ladies US) or 42 (European) and I am rather jealous of sock knitters with small feet! That's okay - I'm in the home stretch now. Just a few inches, and a second sock, to go! What's the best way to take pictures of one's own feet? This was the only good picture I could get. I tried various angles, but either my ankle disappeared, or the stitch pattern didn't show up well, or my foot looked gigantic (wait, my foot is gigantic) or it was unflattering in one way or another. Perhaps when the pair of socks is done, Pirate-Husband will assist with the taking of pictures. 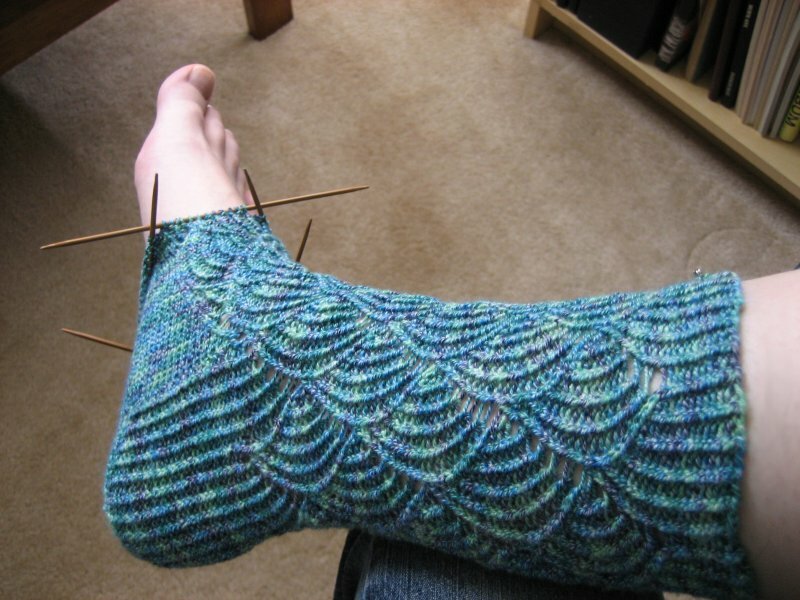 This entry was posted on Wednesday, April 25th, 2007 at 14:59 and is filed under pomatomus, sock. You can follow any responses to this entry through the RSS 2.0 feed. Both comments and pings are currently closed. The easiest way to photograph your foot is to ask nicely for someone else to do it. That said, Pirate Husband would be happy to photograph you in any way you like. I'm knitting it exactly as written. I hit gauge using US 1s and the Plymouth Sockotta, so I went for it! Have you tried Zappos (www.zappos.com) for shoe-shopping? I've had a lot of luck there. I've done lots and lots of window-shopping at Zappo's, but I haven't had the sort of money necessary for indulging. I'm getting a bit desperate for shoes right now, though, so maybe I should take a more serious look. Beautiful socks, congrats! I'm knitting Poms as well and am currently stuck with a size problem. I have very small feet, European 32.5 (would that be about a US 1-2?) - yes, they're about the size of an 8-year-old - and they're narrow. And it's NOT fun. So far I've just left out 1/3 of all the stitches and the size is just right, but now I'm at the heel turn and don't know how to adjust the turn heel stitches without messing up the pattern later. These are my first ever socks... If you have experience in altering patterns to get the right fit or if you have any suggestions, please e-mail me. Thanks!